Students had to digitally develop a lamp-shade based on a chosen gastropod shell. After an intensive geometrical shape and growth analysis of the shell each developed a parametric model in Rhinoceros 5.0 + Grasshopper. To build a working prototype the original double curved objects had to be rationalized and made build-able out of white cardboard+additional materials. 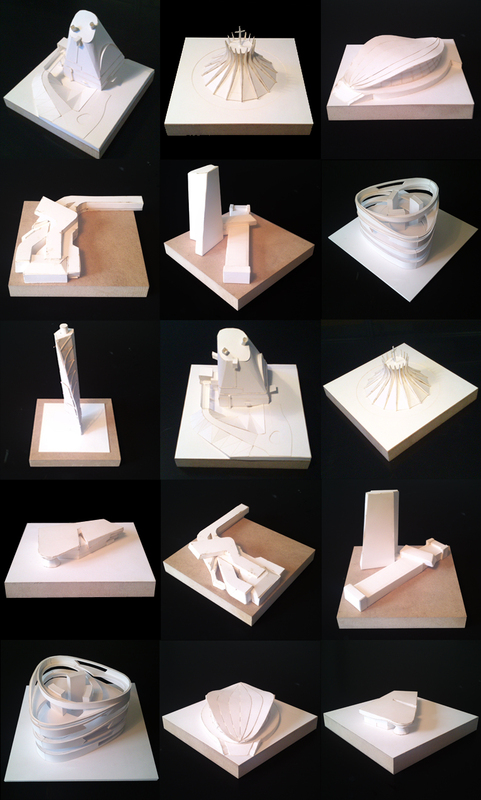 …after reconstructing a digital nurbs model from plans, sections and pictures of “a geometrical advanced in shape building of the last century” in Rhinoceros, the students had to rationalize the geometries and layout A4 “cutout” sheets, build a sample model (see above) and create assembling instructions. August 22, 2016 | Filed under COURSES, PRODUCTION and tagged with cnc, grasshopper, lasercutter, production lab, Rhinoceros, semester task, studio Lynn, studio Rashid.